We love this plant for so many reasons! The rare San Diego Willowy Mint is a true San Diego native that combines hardiness with beauty. There are very few occurrences in the wild now, as development has reduced its habitat. 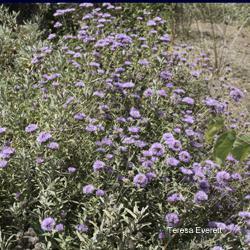 This plant has aromatic minty foliage and lavender flowers that bloom for a long time. Also, it flowers late into the fall, so can provide nectar for its butterfly fans when many other nectar plants are long gone. It is a great plant for butterflies and also looks and does well in containers. Provide well-draining soil and occasional water.